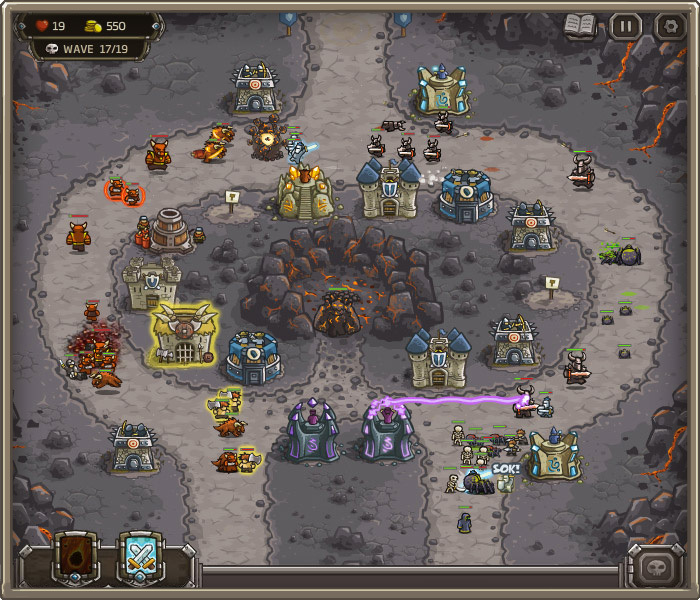 Kingdom Rush was a surprise discovery while I was wondering the wastelands of browser games. Until very recently i’d never played any of the browser games and had mostly written them off as dull time-sinks. However via a convoluted path, which started with looking for non-violent games for my son to play, I ended up playing Goodgame Studio’s Empire (more on that in another post). This got me thinking that maybe these browser games aren’t all bad. There is a lot of trashy browser games, but Ironhide Game Studio’s Kingdom Rush isn’t one of them. Basically this is a browser-based, fantasy tower defence game. The bad guys come from one or more sides and you have to kill them before they escape off the exit side. Sounds basic, but the bad guys are so cute and in fact all the graphics are well done and clear. There is a number of features to this game which not all tower defence games have. The enemies get harder as you advance and each is introduced with an overview of their abilities. Your towers can of course also be upgraded and at their highest level (four) they can gain a number of special abilities. Mage towers can gain teleports to transport enemies backwards, polymorphs them into sheep and summon earth elementals to fight for you. Your paladins at your barracks can get healing and heavy armour, etc. There is a free campaign with ten battles to win and progressing through them all takes about 10 hours. As you progress you get points (stars) to spend on skills which upgrade your towers with more range, more health, slowing abilities and more. You can achieve up to three stars per battle and there is some replay value in re-fighting battles to try and pick up that extra start or two to improve your towers. There are also Heroic and Iron Man modes once you have completed the normal mode and these are very challenging. There a more screen shots and strategy guides on the official website for Kingdom Rush. One of my few complaints about the game is that you can’t enlarge the viewing area unlike some browser games. I guess this does ensure you stare at their advertising the entire time your are playing 😉 Overall i’d give this 9/10 for fans of tower defence games and recommend even those new to tower defence games give this cute little title a look. This entry was posted on Tuesday, November 1st, 2011 at 7:39 pm and is filed under Games, Reviews. You can follow any responses to this entry through the RSS 2.0 feed. Both comments and pings are currently closed.